Shefford Town & Campton took full advantage of Renhold’s match being postponed to open up a three point lead at the head of the Premier Division with a 2-0 home victory over Eastcotts AFC on Saturday. Shefford Town & Campton took full advantage of Renhold’s match being postponed to open up a three point lead at the head of the Premier Division with a 2-0 home victory over Eastcotts AFC. It means they remain unbeaten on home soil this season in the Premier Division supported by Sportsform. Ryan Lewis and Andrew Hayday netted the goals to do the damage and ensure revenge was taken for their defeat at Eastcotts just seven days ago. Also enjoying that same feeling were AFC Kempston Town & Bedford College who, in having been removed from the Bedfordshire FA Senior Trophy by AFC Oakley M&DH last weekend, this week claimed their first home league win and ended their visitors’ five game unbeaten league run with a 4-1 victory. Tim Clarke scored twice alongside single strikes from Paul Obuch and Humberto Mbunazo against a lone reply via Marc Umney. Elsewhere lifting themselves off the bottom of the league table are Ickwell & Old Warden who returning to winning ways with a 2-0 home win over AFC Turvey who have now failed in win in any of their last 15 league outings to now leave them just one place above the drop zone. An own goal plus a strike from new boy Liam Brophy did the damage. All of which means Lidlington United Sports are now back onto the bottom of the table following their 4-2 home defeat by Sharnbrook. Shaun Barnett, Jim Burnside, Leon Taylor and Richard Bull on the winners scoresheet against home replies from Kieran Willis and Julian Wilson. For Pavenham it was an extension of their unbeaten run to four games with a 4-1 victory at Caldecote. Two James Owen goals inside the opening 10 minutes saw them take early command until Rafe Goodman reduced the arrears to give the home side hope just before the half-time break. That was to last just 10 minutes into the new period before Owen completed his hat-trick to make it 3-1 and the visitors scoring completed with the goal of the game from some 45 yards out by a Jack Harding free kick two minutes from time. The games Sandy v Flitwick Town and Wilstead v Wootton Blue Cross were postponed due to the state of the pitches at Bedford Road and Jubilee Playing Fields. 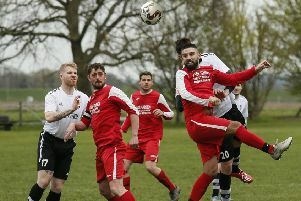 The new leaders of the Division One supported by Wests Citroen Bedford league table are Elstow Abbey who chalked up win number five on the bounce with a 6-2 victory at Sundon Park Rangers. Ahead in just 22 seconds with a strike from Danny Pilgrim, Adam Carvill was to double their lead from 45 yards just 15 minutes later and Jason Simons made it 3-0 just after the half-hour mark before Pilgrim netted his second of the afternoon from the penalty spot in the last action of the opening period. The nap hand goal was brought up by Sundeep Gill seven minutes into the second half before Shaka Anderson on the hour mark reduced the arrears to just four goals. Alas for the Rangers this was to last for just 10 minutes until Tom Pitts popped in goal number six for the Abbey who then saw Anderson complete the games scoring with his second goal of the contest from the penalty spot five minutes later. Losing out on that top spot were Henlow who were held to a 2-2 draw at Riseley Sports. Mark Darlow and Karl Walker were on the home scoresheet against replies via George Renney and Keith Milburn. Third place Cranfield United took their winning run to five games with a 4-1 victory at Potton Town. Pete Hanwell placing them into an 18th minute lead which was doubled from the penalty spot by Liam Whitmee Craig some 15 minutes later until the Town’s Chris Moore reduced the arrears just two minutes from the half-time break. However, second half goals from Martin Holland in the 59th minute and David Adderson 14 minutes from time saw United safely collect the full three points. For fourth place Great Barford it was an end to their eight game winning run when held to a 1-1 draw at AFC Oakley M&DH Reserves, Rueben Hukin on their scoresheet against the home reply via Mitchell Crook. Whilst fifth place Meltis Albion took their winning ways up to three games with a 2-1 win at Shefford Town & Campton Reserves thanks to strikes from Carl Townsend and Craig Damon against a lone reply from Sean Duignan. The final game in this division saw Queens Park Crescents and Marabese Ceramics share the spoils for the second weekend running in a 1-1 draw, Toseef Masud on the Crescents scoresheet against a Tilerman reply via Kevan Fehmi. Just three points now separate the top four clubs at the head of the division two league table. League leaders Westoning saw their lead at the head of the table reduced to just a single point following the postponement of their home encounter with Kempston Hammers Sports coupled with the 8-3 win of now second place FC Houghton at Meltis Albion Reserves which lifted them a point clear of the non-playing Clapham Sports. Mark Doran led the way with five goals, Lawrence Taylor netting twice and Charlie Nicholson once to bring up their clubs 11th win on the bounce against home replies via Josh St Clair Pierre twice and Asa Garlick. Just a point adrift in fourth but with games in hand on all of the leading trio are Stevington who took their own winning ways to nine games with a 7-0 win at Bedford United. James Bourke, Reece Williams and Tristan Clarke all netting twice alongside a single strike from Joe Holyoke. For fifth place Elstow Abbey Reserves it was a return to winning ways on home soil with a 7-2 win over now second from bottom of the table Caldecote Reserves. Myles Ferraro with a hat-trick and braces from Andy Klein and Shaun Cafferty shooting them 7-0 ahead before Stuart Kemp netted a brace for the visitors in the game’s closing 10 minutes. Moving out of the drop zone above Caldecote Reserves are Marston Shelton Rovers Reserves who claimed their first away points of the season with a 4-3 victory at Renhold United Reserves. Jamie Cerminara netting all four goals against home replies from Lewis Debbenedittis, Josh Crowley and Michael France. There was late drama at Wootton Village who claimed a 90th minute winner from Tinashe Chibanda to overcome visitors Moggerhanger United 3-2. An own goal plus a strike from Nick Burraway earlier marking the Village scoresheet against United replies via Lee Adams and George Tyrer. The Kempston Athletic v Wilstead Reserves game was postponed due to the state of the pitch at Cutler Hammer. Lea Sports PSG now have a four point lead at the head of the division three league table after they were gifted three points when Shefford Town & Campton A failed to raise a side to meet them at their Pirton base and second place Atletico Europa had their five game unbeaten run ended with a shock 5-2 home defeat at the hands of Westoning U20. Rex Ludlow scored twice alongside single goals from Alex Bennet, Bryn Reynolds and Sean Cooksley for the winners against home replies from Simon Gatward and Ishmael George. Now just goal difference behind in third spot are Clifton who ran out 4-1 home winners over Sandy Reserves. Charlie Watson and Andy Harding both netted twice against a lone reply via Jonny Stratford for the visitors. Yet all the leading trio will be well aware that the now fourth place Cranfield United Reserves have games in hand on them all which could if won take them to the top of the tree after they retained their seasons unbeaten home ways with a 4-1 win over Dinamo Flitwick. Trailing to an early strike from Dom Loadman, United were via a brace from Phil Kempsell 2-1 ahead by the half-time break before sealing the full three points in the second period via a hat-trick goal from Kempsell which was added to by a late strike from Ben Thompson. Also still unbeaten on home soil this season are the now fifth place Flitwick Town Reserves who kept themselves in the promotion mix with a 3-0 home win over second from bottom of the table Caldecote U20. Mark Funnell, Benn Ward plus an own goal marking the Town scoresheet. The Mid Beds Tigers v Ickwell & Old Warden Reserves game was postponed due to the state of the pitch at the Sandy Academy. The result of which means the visitors drop from fourth in the standings to sixth but like Cranfield United with games in hand are still very much in the promotion mix.